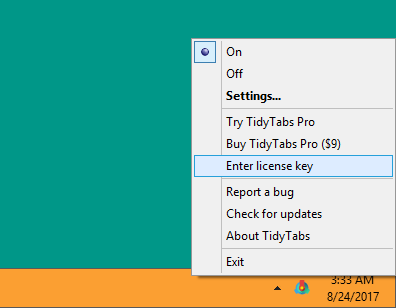 The Personal Edition of TidyTabs is for a personal use only and don’t give you access to all the features. In order to use TidyTabs to its full extent and for a professional activity, you need to purchase a license for the Professional Edition. Right-click on the icon in the System Tray and choose Enter license key. 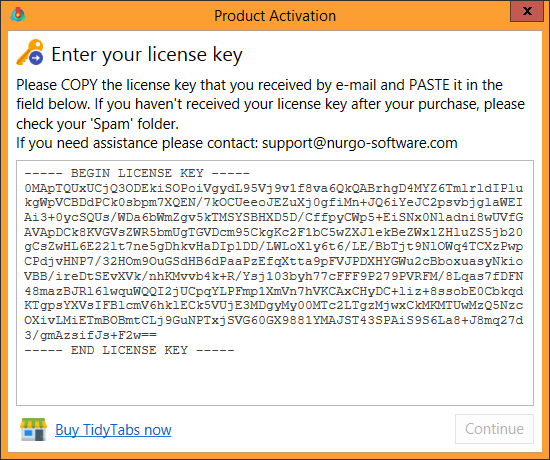 The Product Activation window will appear, asking you to enter the license key that you received by email after the purchase. You can verify that TidyTabs is registered by hovering over the tray icon with your cursor, a tooltip should appear with the text TidyTabs Pro.